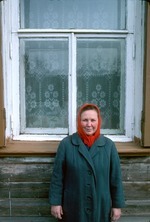 ﻿ Woman in blue coat standing in front of the window of a wooden residential structure. Lace floral curtains visible through window. Woman in blue coat standing in front of the window of a wooden residential structure. Lace floral curtains visible through window.